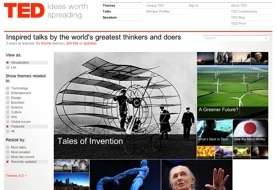 TechnologyIQ: TED Talks give you deep learning...for free! TED Talks give you deep learning...for free! TED stands for Technology, Entertainment and Design and it is one of the most exclusive conferences in the world. That said, you can now see hundreds of the talks from TED from the comfort of your own computer. There are talks on Technology, Science, Culture and more from some of the best known names in the world, including Bill Clinton, Jane Goodall, David Pogue and Frank Gehry. The TED.com web site brings the world's foremost authorities right into your home or office. Check it out, but don't blame me if you lose yourself there. Of course, your time will be very well spent.